Studio Herman Hertzberger designed the Titaan, a new type of building for lower secondary professional education in the town of Hoorn. The school opened its doors to the public on Saturday April 17. 'The school is the last remaining building where relevant social issues are raised,' according to Hertzberger, who sees an important role for himself in the school building: his aim is to make spaces in which children can develop into responsible members of society. 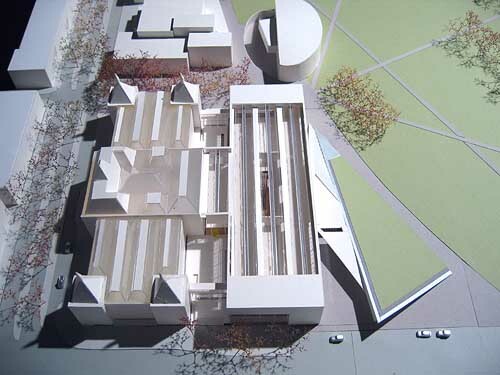 In terms of both organisation and architecture, the 1000 pupils are divided into three units. 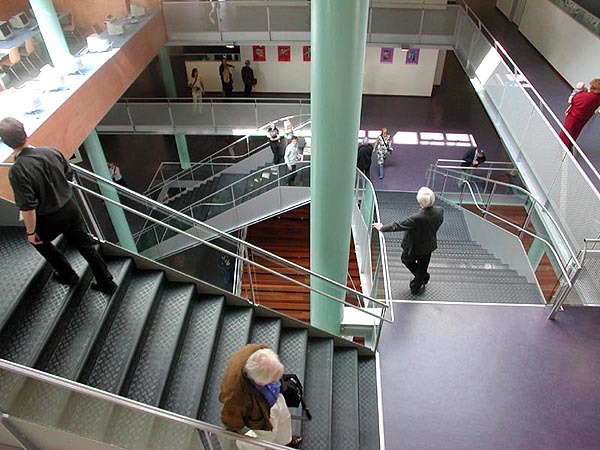 Each unit occupies a separate floor; circulation of teaching staff and pupils between the different units/floors does not occur in principle. Hertzberger placed the three units on a plinth containing practical training rooms and sought, in line with school policy, to articulate the three units as distinct spatial entities. Elements such as the large central void break down the hegemony of the classrooms. The school units are 'stacked like firewood on top of one another'. There are no alcoves like those Hertzberger designed in earlier schools. 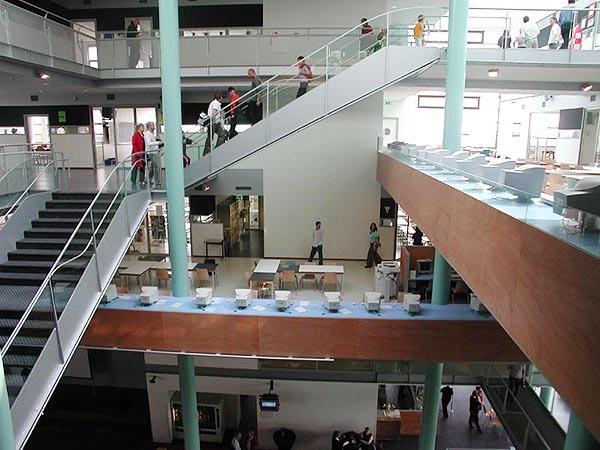 Instead, he designed spacious stacked learning/working areas, which are separated from the surrounding classrooms by large glazed harmonica doors. These spacious areas (called learning or working squares) next to the classrooms can also be used during lessons. Corridors are almost nowhere to be found in the building. All classrooms, including the workshops, are grouped around a large central void flooded with daylight. 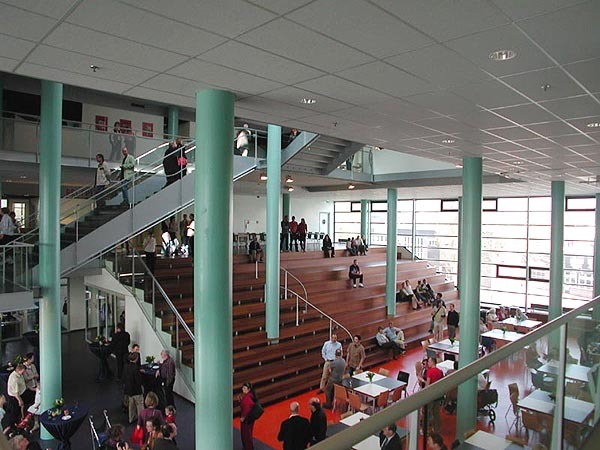 At the core of the building is one large communal space that doubles as the assembly hall. The flight of stairs functions as a seating gallery. The entrance and the main reception area are located on the first floor. A large, broad exterior stairs takes visitors up to this level. The first thing to do if you visit the building – as Hertzberger tells us in his lectures – is to sit on the stairs of the assembly hall and take in the overwhelming spatial effect of the big central void. Though the school is open, spacious and inviting from within, the exterior presents a blank and detached face to world outside. To Hertzberger's regret, the schoolyard is enclosed by tall railings that form a definitive line of division between the educational enclave and the surrounding industrial area. If Hertzberger's next school is located in lively urban surroundings, the result can only be more spectacular. Lower secondary professional education has a bad name, and that's what client Ben Steenweg wanted to talk about before discussing the building. That bad name is the result of a number of incidents in a number of schools. 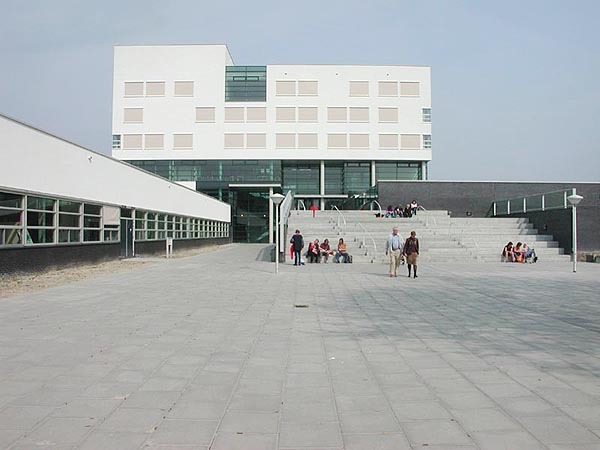 In Hoorn the problems are almost negligible, and the school is viewed in a very positive light by all involved. The school hopes to consolidate this success and create a bond with each and every pupil by offering good counselling and providing a small-scale environment with good social control. The new building is designed to reinforce this policy. Building contractor Heijmans teamed up with Herman Hertzberger in a 'Design & Construct' contract for the construction of Titaan. Hertzberger told his audience on the open day that he was at first sceptical about the chosen process of design and construction, and he subtly pointed out that Design & Construct can be shortened to 'de-struct'. In passing he pointed out the weakness of all (good) contractors. 'Ensure that they enjoy themselves and are enthusiastic about the building, and then they'll do their best to make it a good building.' Martin Koster, representing the contractor: 'In total almost 200 people worked with pleasure on this building, there was plenty of manual work, and much of the material was processed on site.' Koster jokingly referred to Hertzberger as 'Sketchberger' because the latter kept designing until the project was finished. No sooner had Koster finished his story than the architect, true to reputation, presented the contractor with a sketch to alter the roof terrace.